The harsh and rugged Colorado frontier of 1875 is not the type of place most would consider suitable for a recent widow to establish a home of her own. Yet that is exactly what Henrietta Schodde determines she will do as she impetuously buys a cabin in the newly forming settlement of Estes Park. How will Henrietta’s future in the settlement unfold? Is she ready for a life on the frontier? 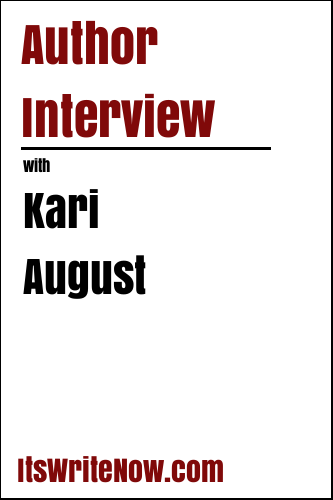 To find out, one of our favourite returning authors, Kari August has kindly dropped around ItsWriteNow.com for a quick chat. Kari, it’s great to see you today! What’s been keeping you busy since we last chatted in March? I’m writing my next novel about Margaret of Burgundy, the sister of King Richard III. A return to Richard III, that sounds like so much fun! It’s been a little while since you were writing about him, do you still feel energised by writing in this period, or is it starting to become a little exhausting? I love authors who are energised by their work as I think it makes writing so much more fun. What fun have you recently found in your author journey? I love the encouraging reviews I have been getting. Positive reviews are awesome! Another thing that I think it pretty awesome is that first temptation you get of a book’s plot. Can you tempt us with what to expect from ‘Settling in the Wind’, by sharing a little taste of what readers can look forward to in this novel? Sparks fly when a recent widow discovers her childhood nemesis has been sent by her relatives to watch over her after she buys a cabin in rugged frontier, Colorado. But the pair quickly realizes they have more than each other to fight about when an unscrupulous Englishman begins hungering for their land. Those unscrupulous Englishmen! You have to keep an eye out on those devils! One thing I’m curious to find out about is how your characters, devils included, came to life in the frontier surrounds? From reading about distant relatives and historical figures. Was it the historical figures and relatives that originally sparked your interest in the tale in this book, or were you driven by reading something else? I began by learning about the history of Estes Park, Colorado which is the town adjacent to Rocky Mountain National Park. Colorado has changed a fair bit since the 1870s, so to round out today’s interview, can you share what you feel was the most important message that crosses time to be relevant to readers today? My editor relished that the main character achieved what she wanted through kindness. Kindness isn’t always the first method that someone picks to achieve what they want, but I’m glad to hear that it worked for Henrietta. Kari, I’d best let you return to the world of historical England with Richard III and Margaret, but I hope to hear about your next adventures soon! Excited to read the book we discussed today? Find it here on Amazon: ‘Settling the Wind ( ASIN: B07CV469HP )‘.